At Northenden GC we pride ourselves in welcoming visitors but, recently, many members will be aware of an increasing number of noisy, non-paying guests populating our course. 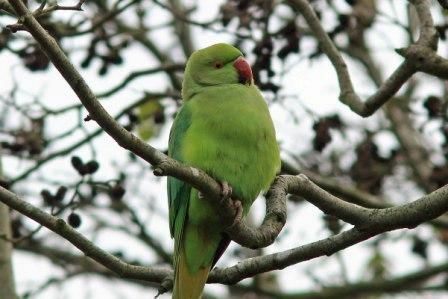 Originally from Africa and southern Asia and kept as caged birds, some Ring-necked Parakeets escaped and by the 1970s started breeding in south-eastern England. In recent years a small population has been steadily growing in South Manchester , particularly in the Didsbury area, and is now expanding along the Mersey valley. Ring-necked Parakeets are very noisy and their call is a shrill screeching sound. In both sexes the plumage is bright emerald green, the hooked bill is crimson and their very long tail is a blue-green. The legs are greenish-grey. The parakeet's diet consists of seeds, berries, fruits, flowers and nectar, but British birds will also eat wild bird seeds and meat (such as bacon rind and meat from bone). Both males and females have the ability to mimic human speech. First, the bird listens to its surroundings, and then it copies the voice of the human speaker so would golfers please be careful to moderate their language after that duffed shot!